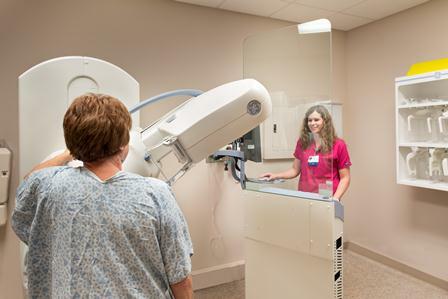 The Women’s Services Department uses the latest mammogram technology to obtain clearer images for proper diagnosis. The user-friendly design of our equipment means greater comfort for a women while receiving her breast cancer screening and diagnosis. The new technology cuts scan time in half, allowing patients to be seen more quickly. The only preparation needed is that women should not wear or should remove deodorant. Deodorant pads are provided for patients to use for reapplication after their mammogram. Screening mammograms: The American Cancer Society recommends that women have a yearly screening mammogram after age 40. No physician order is needed. The exam takes about 15 minutes. The patient’s primary physician receives results; the patient also receives results by mail. Diagnostic mammograms: These mammograms are ordered by physicians when a patient has an abnormal screening result or other symptoms and follow-up is recommended. A diagnostic mammogram takes about 30-45 minutes, and the physician often requests a breast ultrasound in addition to the mammogram. A radiologist reviews the exam with the patient. The patient’s primary physician receives results; the patient also receives results by mail. 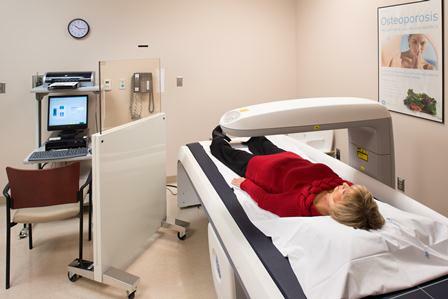 The latest in bone densitometry equipment is available at Fort Loudoun Medical Center for detection of subtle bone changes which might indicate the beginnings of osteoporosis. The diagnostic information is faster and more accurate than older procedures. This comes at a time when medical specialists are reporting new treatments that may help patients regenerate bone mass – and partially reverse the effects of osteoporosis.Our technology also can help detect advanced hip and vertebral problems. Ultrasound units provide the latest in scanning capabilities. With this technology, doctors can see images of internal organs as they function and also can assess blood flow. Doctors at Fort Loudoun Medical Center not only use ultrasound in the Women’s Services Department, but also for heart patients and to obtain images of the abdomen and blood vessels. This technology allows images to be electronically captured, stored and transmitted – all without film. Picture Archival & Communication System (PACS) makes high-quality pictures immediately available by computer. That means doctors can readily view any images a woman has had taken at Fort Loudoun Medical Center and other locations in the Covenant Health system. PACS offers clear images that help doctors make more accurate diagnoses and plan more effective treatments for patients.